This is a perfect breakfast option for the whole family. 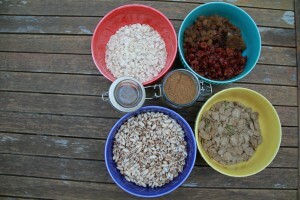 Add the rolled oats, brown rice puffs, spelt puffs and buckwheat flakes to a bowl and toss together. Add pepitas and cinnamon and mix well. Add dried cranberries and sultanas. Store in an airtight contained or jar. Serve with some chopped banana or strawberries and your choice of plant based milk.